Qualified at Stellenbosch in 2000 and worked in London for just under 3 years. After moving back to Cape Town, worked at various dental practices before opening his own practice in 2005 and moving to Renaissance in February 2006. Comprehensive oral exam and smile analysis including digital x rays, intra oral camera and diagnodent early caries detection. Porcelain crowns, veneers, inlay and overlays done on site with Cerec CAD CAM technology. Permanent porcelain units in 1 hour. Only 1 appointment needed, no temporization through computer assisted porcelain restoration fabrication. In some cases, where needed, porcelain restorations are fabricated in conjunction with registered dental laboratories. Tooth whitening of vital teeth, removes stains inside the teeth resulting in a lighter, brighter white smile. In chair and at home options available. Oral hygiene, preventative dental care. Guaranteed pain free and comfortable cleaning by our gentle oral hygienist to maintain oral hygiene and beauty. Implants, bridges and general restorations to restore function and aesthetics due to tooth loss or damage. White fillings, metal free dentistry, minor aesthetic enhancing dentistry. 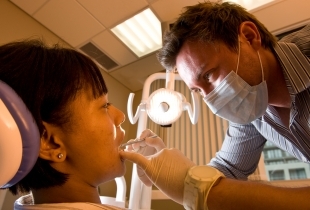 Sedation available for nervous or anxious patients. Saturday and evening appointments will be available. At our practice with our highly trained staff we try to make your visit as comfortable and relaxing as possible.